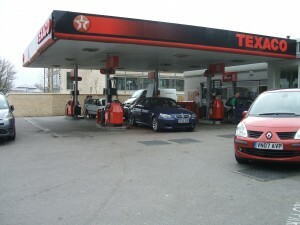 Bridges Garage, formerly a Renault Car Dealership and Texaco fuel filling station was operational from the early 1960’s and ceased trading in June 2008. Redevelopment of an adjoining site had revealed widespread hydrocarbon contamination of the Cornbrash and underlying Forest Marble Mudstone Formation associated with the former garage site. Hydrogeo were appointed to provide technical consultancy support during the purchase and subsequent redevelopment of the former garage site. A crucial component of the works progressed was the commission of a detailed groundwater risk assessment to quantify the risks to groundwater presented by the residual concentrations of contaminants in soil and groundwater. The detailed quantitative risk assessment (DQRA) was also used to derive screening criteria for soil and groundwater at the site for future groundwater monitoring and remediation works planned for the final development. 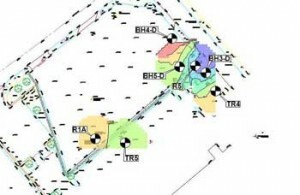 Consim software was used to undertake the groundwater risk assessment and was used to model the risks to both shallow and deep groundwater bearing strata. The groundwater risk assessment demonstrated that the residual soil and groundwater concentrations presented no unacceptable risk to groundwater receptors. Hydrogeo presented the findings of the groundwater risk assessment to the regulatory authorities, which resulted in the discharge of the relevant planning conditions.